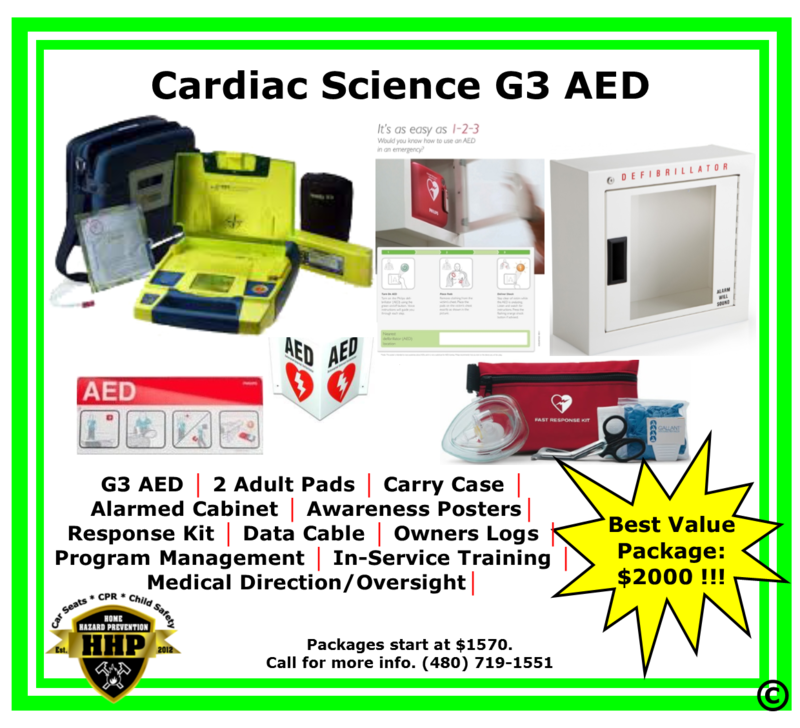 Cardiac Science G3 Portable Defibrillator (AED) is the workhorse of the AED world. A favorite of Police Departments and located through out many public locations, the G3 is a true workhorse. – The Powerheart® AED G3 Plus is the flagship Cardiac Science automated external defibrillator (AED) that features Rescue Ready®, RescueCoach™, and STAR® biphasic technology to make your rescue as simple as possible. – Rescue Ready® technology that self-checks all main AED components (battery, hardware, software, and pads) daily. – The AED completes a partial charge of the high-voltage electronics weekly, and a full charge monthly. – Clear voice prompts and a helpful text screen guide the user through the entire rescue operation. – Rescue Coach™ and CPR metronome functionality pace users through chest compressions. In addition, our proprietary STAR® biphasic technology calculates electrical impedance and escalates energy to deliver therapy at an appropriate higher level should a patient require a second shock. 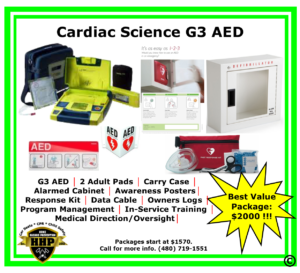 – Cardiac Science stands behind our Powerheart AED G3 Plus with a 7-year warranty, among the longest in the industry, and a 4-year full battery operational replacement guarantee. At HHP, we have trained hundreds of people in CPR and proper use of AEDs. Most people are very receptive and competent in their CPR skills when they leave our sessions. But many feel less than excited about using AEDs. In fact, they should prefer to use our AEDs! Hands-only CPR is very labor intensive and requires you to continually touch another person to save their lives. This has a high rate of survival (about 65%). But it’s physically demanding on the rescuer! Using AEDs is simple. So simple in fact, that it requires the rescuer to touch the victim once, then press a Green Button, and then listen to the voice prompts from the machine. The AED coaching is always there- meaning you do not have to remember or count anything! If there is a second rescuer around, we always want one person to apply the AED and the second to continue CPR until the AED tells you to stop. Correct use of CPR and AEDs increases the odds of survival from about 8% to over 80%!